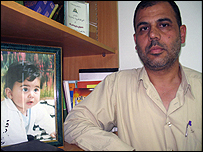 For Walid al-Houdaly, 46, the capture of an Israeli soldier by Palestinian militants offers the opportunity that his wife and their 18-month-old child will be freed from prison. The Palestinian militant factions who captured Cpl Gilad Shalit on Sunday - including the Izzedine al-Qassam Brigades, the military wing of the ruling Hamas party - have called for the release of all Palestinian women and children held in Israeli prisons in return for news on the missing soldier. 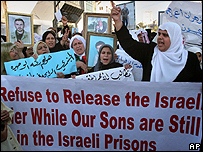 Israel is believed to have about 100 women and 300 under-18s among the more than 8,000 Palestinian prisoners in its jails. Like many Palestinians, Mr Houdaly believes that the world is focussing on the fate of one Israeli soldier when thousands of Palestinians have been imprisoned or detained in what they regard as their fight for independence. "There is one soldier, but there have been hundreds of Palestinians kidnapped from their houses," says the writer, referring in part to his wife who he says was dragged from their Ramallah home by Israeli soldiers early one morning. "If the world protests about the kidnapping of one soldier, why don't they protest about the Palestinians that have been kidnapped in the last 10 years," Mr Houdaly adds, sitting in his Ramallah office with books scattered across his desk. Mr Houdaly says his wife, Ataf, 44, headed a women's organisation dedicated to providing health services for poor Palestinians. But for the last seven months, Mr Houdaly says, she has been held in Israeli prison under administration detention - imprisonment without charge or trial. The Israeli authorities say that Ataf is a member of Islamic Jihad, a militant group that has carried out recent suicide bombings in Israel, and that she was involved in a bombing plot in 1987. She has denied being a member of the group and plotting any attack. The mother went on a 16-day hunger strike before the Israeli prison authorities allowed her baby Aesha to be brought to stay with her, in the jail, Mr Houdaly says. It is women and children such as Ataf and Aesha that the militant factions would like to see released. But the Israeli Prime Minister Ehud Olmert has warned that Israel would not allow itself to become the victim of "Hamas' terrorist blackmail". "The question of freeing [Palestinian] prisoners is in no way on the Israeli government agenda," Mr Olmert said during a speech in Jerusalem. "There will be no negotiations, no bargaining, no agreements." But the seizing of Israeli soldiers in return for the release of Palestinians is nothing new. Israel has always vowed to bring home its soldiers and civilians, whether dead or alive, making capturing them a top priority for many its enemies. In 2004, Israel released 429 Palestinian and Lebanese prisoners and returned the bodies of 59 in return for the release of one Israeli and the bodies of three of its dead. But Palestinian militants have rarely been successful in abducting Israeli soldiers. The last time was in 1994, when Palestinian militants seized 19-year-old Nachshon Waxman. The soldier was killed with his three captors during a rescue operation by Israeli special forces. Palestinian prisoners in Israeli jails are an emotive issue for the majority of families in the occupied Palestinian territories, says George Jiacaman, a political science professor at the West Bank's Birzeit University. "Since the political process between the Palestinians and the Israelis is dead, many Palestinians think that the only way to get prisoners from jail is through some kind of exchange," he says. Mr Houdaly knows more than most about imprisonment. Apart from his wife, Mr Houdaly was himself jailed for 12 years for being a political organiser. He has also written a non-fiction book The Grave of Lives, documenting the experiences of some Palestinian prisoners. More than most Mr Houdaly wants his wife and daughter to return to his home - and Cpl Shalit to return to his family.